Yesterday was a bright and sunny day. The outside temps topped out at 86 degrees. Got to love this SW Florida weather sometimes. However, HomeSpec inspected a home that had no attic ventilation except some soffit venting. 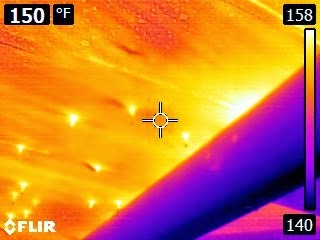 The temps inside the attic 150 degrees. The air handler was up there also and was struggling to cool the home down. I wonder why?